This Blog was an English Assignment. “At a certain season of our life we are accustomed to consider every spot as the possible site of a house.” (Thoreau) Write a description of your “home” or your many “homes.” You may write about the home you have or the home you dream of having in your future. 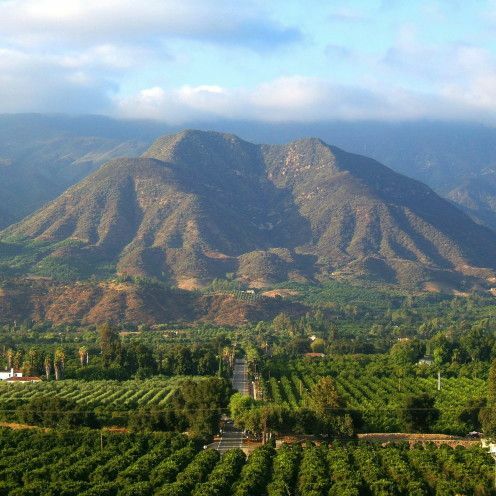 I’ve lived in one house for my entire life, nestled in between two mountain peaks that form the Ojai valley. There are only seven houses on my street, but it was an entire world to explore for my neighbors and me when we were five. We used to walk down to the end of the street and admire the sunset illuminating the overgrown grass and painted white fences. Home, to me, is the smell of the pepper trees that lined the end of the road, forming a green and red arch, as if to welcome me to the end of the cul-de-sac. Sometimes I wish I could go back to those days, when time passed so much slower, when it felt like summer all year long. For as long as I can remember, the ocean is where I find peace. I can’t exactly describe why, but Solimar Beach is a magical place. Home, to me, is poking my toe in the center of a sea anemone, giggling as it squirts water back at me, as its turquoise and bright green tentacles stick to my skin. Home is my dad lifting me up onto his shoulders, then scouring the tidepools, searching for different creatures. As we wade further out into the shallow water, he teaches me about the tides, then we stop for a while to watch the sun sink below the horizon. Solimar is the place I will always want to return to for the rest of my life. I like to think that, someday, I will make a home everywhere. I’ll sit on the balcony of my tiny apartment in Madrid or Barcelona, peering through my neighbors’ laundry, hung up to dry on clothes lines, down at the bustling city below. I’ll enjoy the morning sun as I sip coffee with condensed milk – a flavor that I despise now, but I think, someday, I’ll come to enjoy. I will smile, knowing that I’m there alone. I’m not sure how long I will be there for, probably not more than a year. After that, I’ll move on to somewhere new. I’ll live in a rainy forest along the Oregon coast, then I’ll go work at a school in Argentina or Chile. I’ll work on a ranch in Mexico, outside of a small fishing town. I don’t really care where I go; I just want to see the world. It is true that home is where the heart is, but my heart is everywhere, I think. Growing up in a tiny town has made me appreciate the things that are routine. I love the fact that I could probably draw a map of my hometown purely from memory. It’s incredibly comforting to know a place so well that it becomes a part of you. But it has also instilled in me a desire to leave what is comfortable, to explore and to experience every place, culture, and way of life that is different from mine. A home is a place where you can come back to time and time again, and know that you belong, where you would go to without any hesitation. I’m lucky to have places like these.